When I think of cultural heritage, Malta and its capital city Valletta is one of the first places that come to my mind. So, when I thought of the challenges of visual tools supporting the discovery process within distributed cultural heritage collections, I thought of coming once back to this tremendous island and work with Prof. Milena Dobreva at University of Malta on this. During my short term scientific mission, I explored the issue of visualization tools used across a range of memory institutions in Malta. It was very useful to discuss with professionals from the National Library of Malta and the National Archives of Malta, especially on the topic of on-line access to primary sources (archival material), as in the case of one of the most popular local resources- the Archives of the Sovereign Military Order of Saint John of Jerusalem, Rhodes, and Malta, especially because the National Library of Serbia still doesn’t offer this service. Also, it was insightful to meet a lecturer from the Department of the Architecture & Urban Design Faculty of the University of Malta for additional discussions on aspects of regional cultural heritage. Furthermore, different professionals from the Library of the University of Malta (deputy director, assistant librarian and IT) presented the visualization solutions used in HyDi, the discovery layer implemented in this institution. From their practical experience and the literature survey, it was concluded that there is an ongoing rivalry among several leading proprietary software vendors. Depending on the choice of the software, the same query will probably elicit results that are extensively different, mostly because of the problems with metadata availability. Furthermore, even though the navigation tools for most solutions are very similar, it is still not quite clear according to which criteria the facet values are generated. 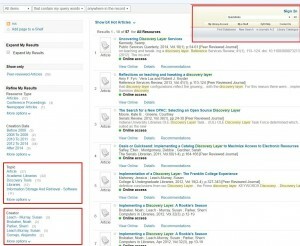 To illustrate the differences, from the Image 1 (showing Primo Ex Libris software implemented in HyDi) and Image 2 (EBSCO Discovery Service implemented in Scientific Consortium in Serbia- KoBSON), on the left-hand side we can see that the same search query (in this case “discovery layer”) elicits some different values in subject/topic index. 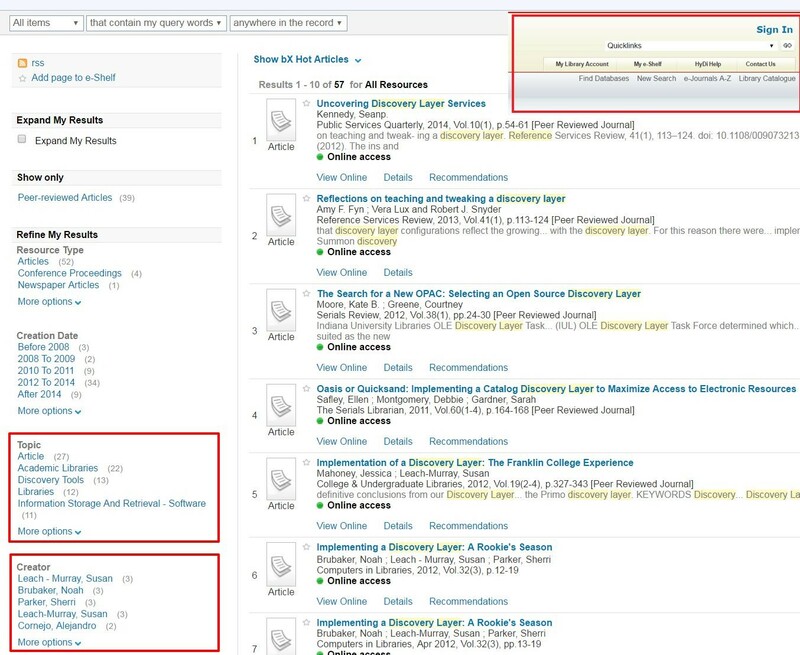 Also, Primo gives possibility to filter results by Author, while in Discovery Service the information on Publisher is more relevant. Finally, HyDi Primo offers some additional options for navigation through resources (e.g. 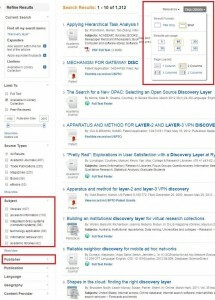 through A-Z list of journals, Database search, Library Catalogue and Personal Space for users), while through KoBSON implementation of Discovery Service users get the possibility of optimisation of page layout (Page Options) and multiple facet choice for filtering of recall. Even though visualisation tools are various, the algorithms and the criteria for the recall ranking are something which librarians cannot easily influence. 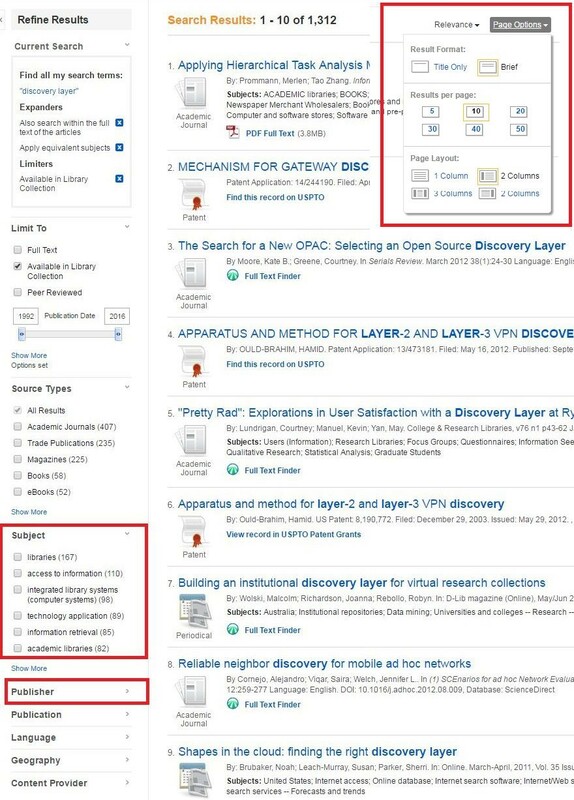 When it comes to Open Source discovery layers (such as Blacklight), they offer more flexibility to librarians to modify the ranking, facets and other navigational tools, however they usually require the same software to be implemented for the library catalogue as well. Also, it may be a risky choice to implement these solutions due to the need in highly skilled IT staff and developing power, as well as additional staff time. So, one of the main issues of this topic, presenting an interesting research question still not explored in detail, is how to educate/allow librarians to influence and edit rankings. Finally, there is no much clarity on the requirements of librarians for “tunable” tools. Our initial interviews with professionals from three different memory institutions in Malta showed diverse opinions on this matter. This line of research can be continued in the future, involving more cultural heritage professionals from other countries. 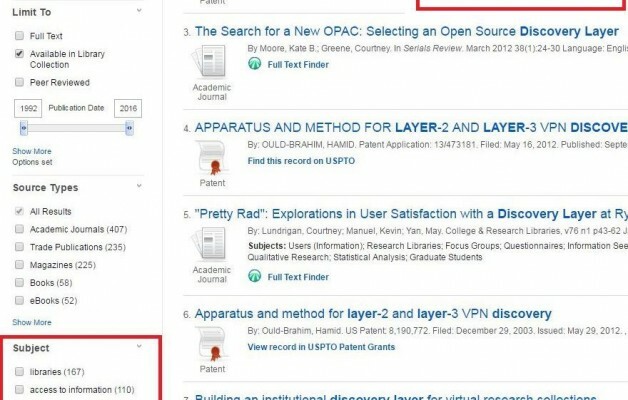 The challenge of offering highly usable discovery layer was tackled for the past 10 years and various institutions tried to resolve it by using different software. According to the study conducted by Chickering and Yang (2014)  we can conclude that so far there is no ideal solution to overcome all the issues that are imposed to the libraries which intend to offer one-stop shop services to their users. Still, the insights gained during this research will significantly influence the choices that will be made when implementing discovery layer software solution in the National Library of Serbia and subsequent publications on this topic will acknowledge the STSM to the University of Malta. Finally, I would like to express my deepest gratitude to the Library, Information and Archive Sciences Department of University of Malta and especially Dr Milena Dobreva for hosting and supporting this research. William F. Chickering and Sharon Q. Yang. (2014). Evaluation and Comparison of Discovery Tools: An Update. Information Technology & Libraries 33, no. 2. Available at: http://dx.doi.org/10.6017/ital.v33i2.3471.